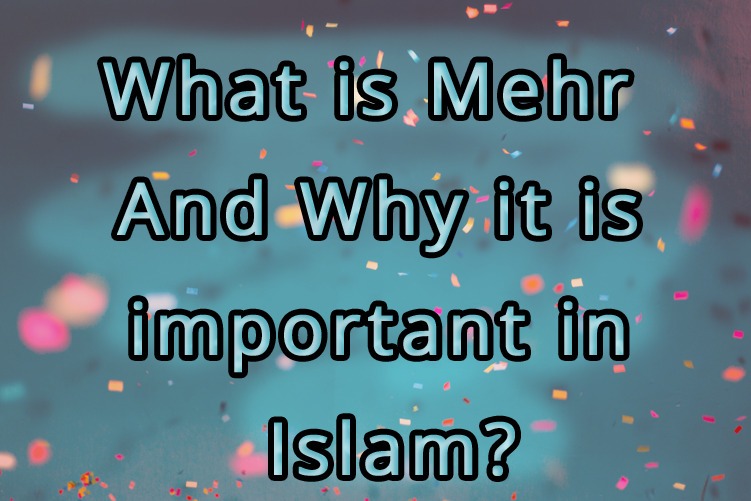 Blog What is Mehr and why it is important in Islam? "And give the women [upon marriage] their [bridal] gifts graciously. But if they give up willingly to you anything of it, then take it in satisfaction and ease." "Give them [a gift of] compensation - the wealthy according to his capability and the poor according to his capability - a provision according to what is acceptable, a duty upon the doers of good." "O Prophet, indeed We have made lawful to you your wives to whom you have given their due compensation and those your right hand possesses from what Allah has returned to you [of captives] and the daughters of your paternal uncles and the daughters of your paternal aunts and the daughters of your maternal uncles and the daughters of your maternal aunts who emigrated with you and a believing woman if she gives herself to the Prophet [and] if the Prophet wishes to marry her, [this is] only for you, excluding the [other] believers. We certainly know what We have made obligatory upon them concerning their wives and those their right hands possess, [but this is for you] in order that there will be upon you no discomfort. And ever is Allah Forgiving and Merciful." When Hazrat Ali came to the Prophet to ask for the hand of Bibi Fatima, the first thing the Prophet asked him was, “Do you have anything to give as mehr?” He said he had a horse and a saddle. He sold his saddle for 480 dirhams and brought it to the Prophet. The immediate needs of the bride and the new household were met with this amount. The concept of jahez, or giving endless amounts of household goods and gifts by the bride’s family, does not exist in Islam. The mehr remains a debt on the dead husband throughout his life and after his death the heirs inherit this debt and are bound to pay it. The mehr is the sole property of the wife and neither parents nor any other relatives have any right over it. Depending on the mode of payment, there are two kinds of mehr: the mu’ajjal, or prompt, and the muwajjal, or deferred. The deferred payment is allowed in the case of those who might be expecting remittances at a later date. But delaying the payment unnecessarily is not being true to the contract. Some people, in trying to be pious, say that they are willing to fix the mehr of their daughters at the rate of the sharai mehr, which some elders have worked out to be the unbelievable amount of Rs32.25! It is difficult to say where they got this figure from. The Sharia, or Islamic law, has not fixed or even recommended any amount which could be called the sharai mehr. The mahr is often paid to the bride in parts. The mahr amount given to the bride at the signing of the marriage contract is called a 'muajjal(معجل) (which is paid at time of marriage (nikah), and the portion that is promised but deferred is called a ghaire mu’ajjal(غیر معجل) (which is paid after completion of marriage). Often the deferred amount is larger than the amount paid at marriage. "There is no sin upon you if you divorce women before touching them or assigning for them a dowry" (Surah Al-Baqra, Verse: 236).